From a conventional viewpoint programming is a process of command execution that brings about a certain result; a problem-solving tool to produce a desired outcome. Aside from its practical usage, coding is expanding to a different sphere of interpretation where new meanings gained, outgrow its primary function. My essay examines the role of non-function oriented programming, the artistic value of the concepts behind works of code and experimental programming languages. 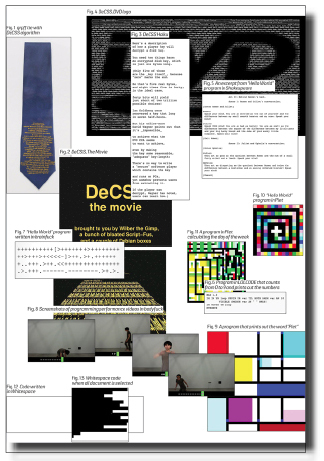 An overview of examples from Algorithmic Auction to ‘Esolangs’ — Esoteric Programming Languages is questioning the boundaries between programming and artistic practice and exploring the creative potential of such method. bodyfuck – undo from nik hanselmann on Vimeo. A work of code can acquire different forms and exist as an object, text or music piece gaining new definitions and material qualities. [audio:http://designblog.rietveldacademie.nl/wp-content/uploads/2017/01/castleman_css_descramble-.mp3|titles=castleman_css_descramble] Likewise conceptual programming languages can be perceived and interpreted by their instructions alone, without executing a command or using a computer. Designed for experience of thinking through them, esolangs unfold the confrontation of computer logic and human thinking in the most rational or the most absurd processes [x].